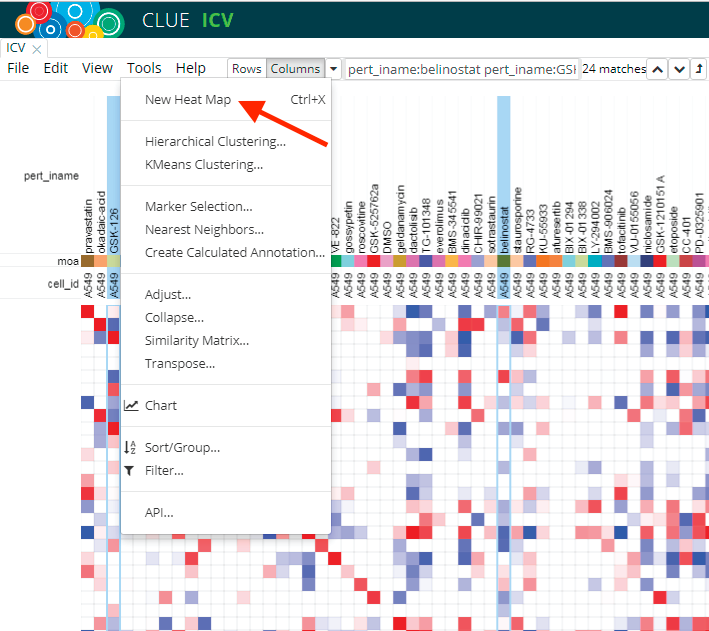 After you select a dataset to explore, you will get taken to the ICV (Integrated Connectivity Viewer) app. 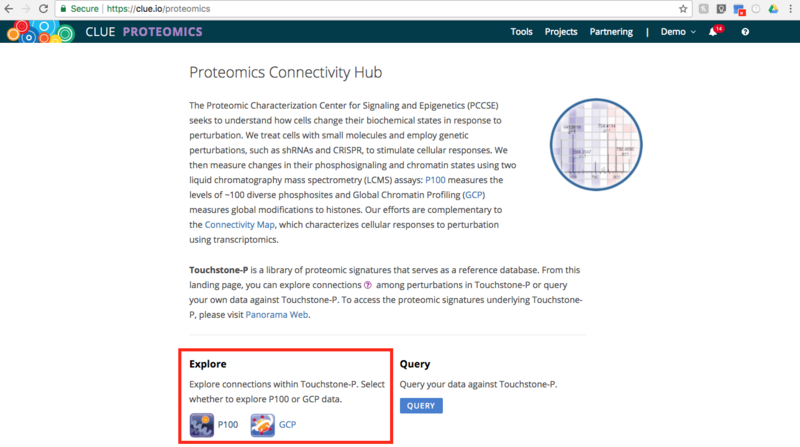 To follow along with this tutorial, choose the GCP dataset. 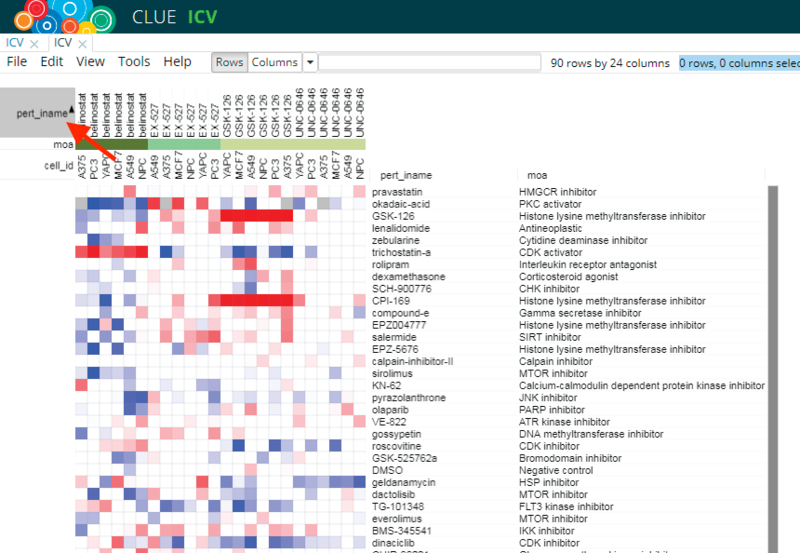 There are 539 columns corresponding to 90 drugs profiled in six cell lines and 90 rows corresponding to the 90 drugs*. 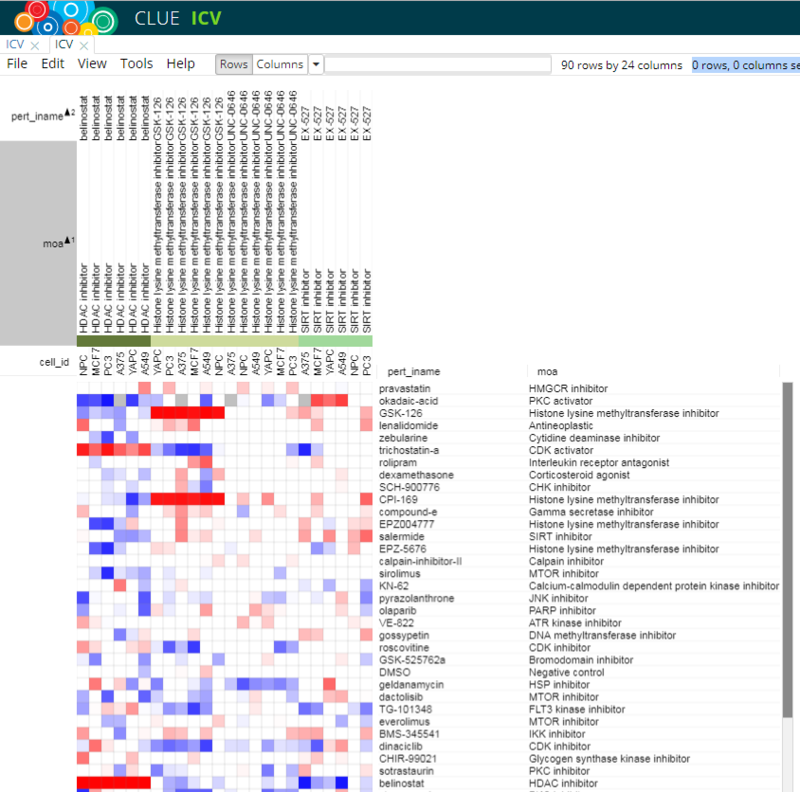 Each value in this matrix is a connectivity score between two perturbagens in the same cell line, indicated by the “cell_id” column metadata; the results for the six cell lines have been horizontally concatenated together. 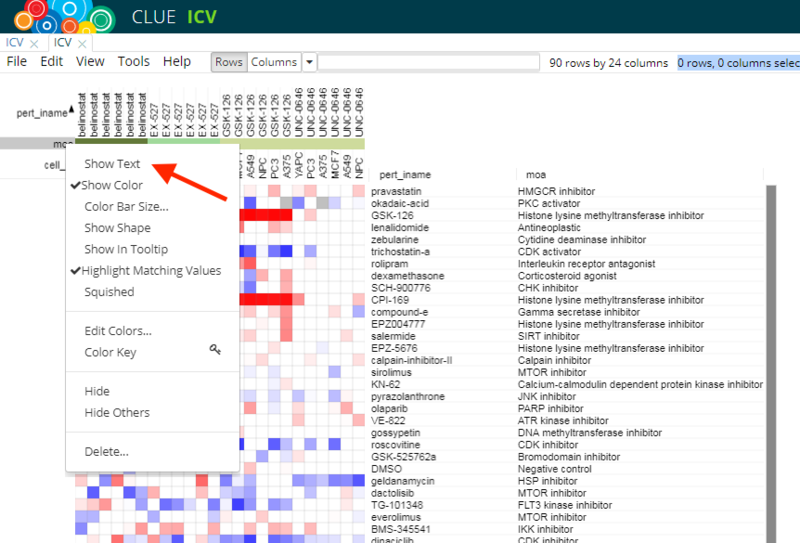 Using the Quick Tools to the right, you can subset the columns to one or more cell lines if you are only interested in results for those cell lines. * One treatment failed quality-control, which is why there are not 540 columns. In the search bar, you can select your compound(s) of interest. 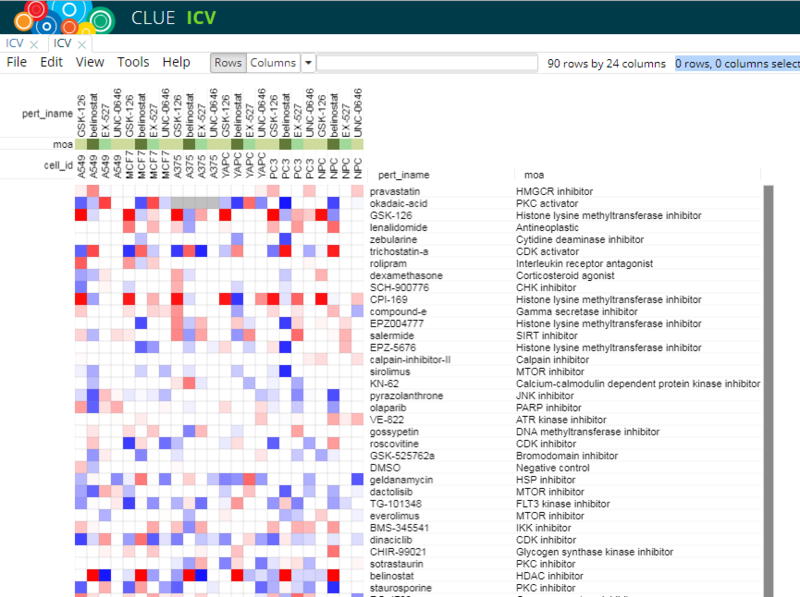 Each column represents the connectivity data for a drug in a particular condition (i.e., cell line, dose, etc.). Pick “Columns” in the search bar, then start typing "belinostat". Suggestions will appear as you type. Click on “belinostat” to select it. All columns for belinostat will be automatically selected. Let’s pick some more. Just put a space in the search box after “belinostat” and start typing “GSK-126”. Click as before. Repeat for “EX-527” and “UNC-0646”. Let’s make a new heat map with just the drugs we selected. 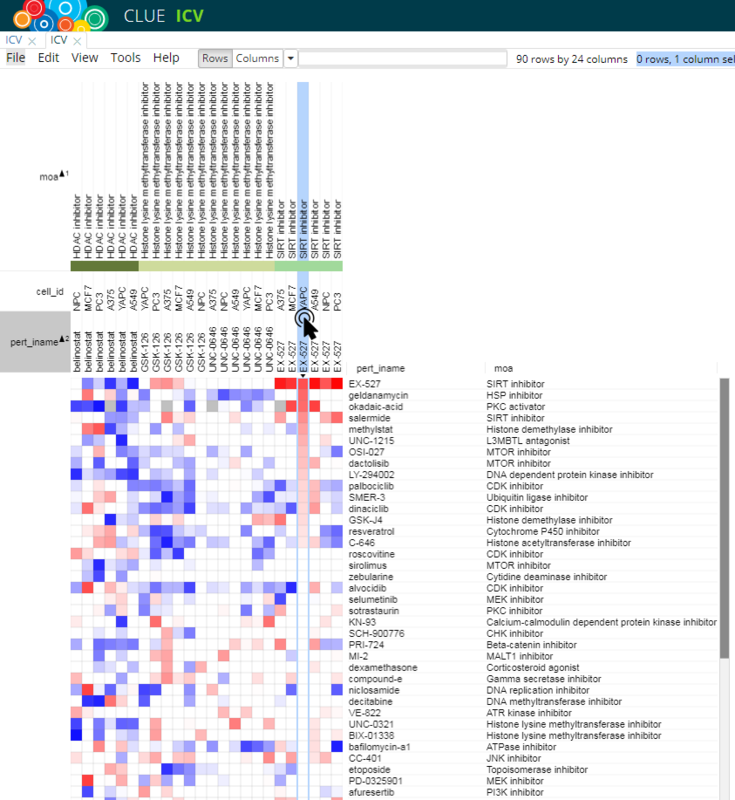 Choose “Tools...New Heat Map” from the menu bar. Tip: make sure no rows are selected by choosing “Edit...Clear Selected Rows” from the menu bar. 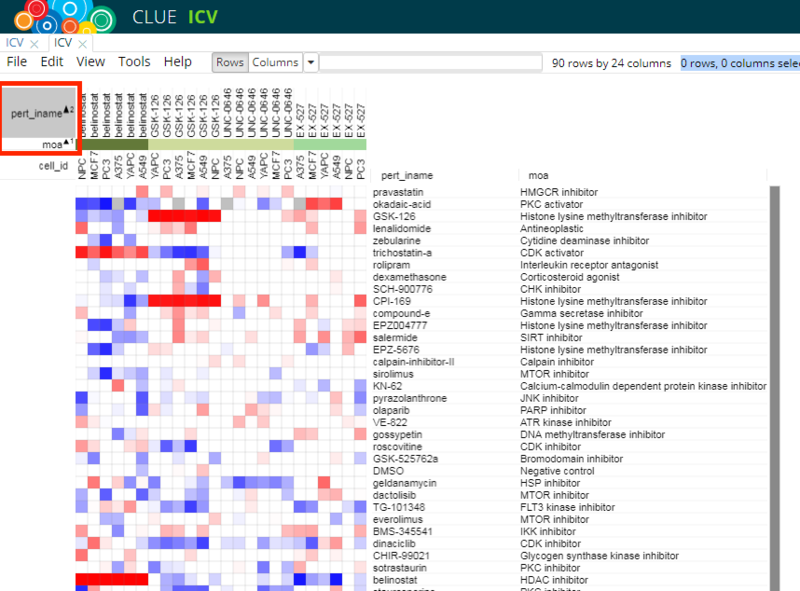 We can sort it by drug name by clicking on “pert_iname” to the left of the columns. You can sort by more than one thing at a time. Let’s sort by MoA first and drug name second. Start by clicking “moa” to the left of the color bar. Then press the shift key and click “pert_iname”. Let’s see what the MoA’s are. Right click on “moa” to the left of the color bar and pick “Show Text”. Voila. The color bars are expanded to readable names. You can rearrange the column headers however you want by clicking and dragging. Here, we dragged the drug name to the bottom and the MoA to the top. If we want to know the closest connections to a drug in a single condition, we simply sort a column. 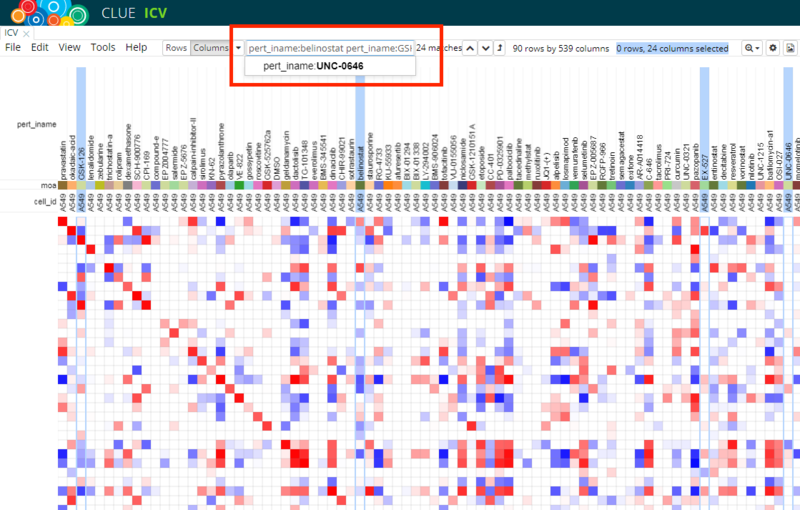 Select “EX-527” in the “YAPC” cell line by clicking on it. The column will be highlighted. Double-click anywhere on the column header (e.g. where it says “YAPC”) to sort by that column. The closest connection to EX-527 in YAPC is EX-527 itself. High self-connectivity means that the replicates of this perturbation were coherent. The next closest connection is geldanamycin. You can also sort by multiple columns. Let’s pick all “belinostat” columns. 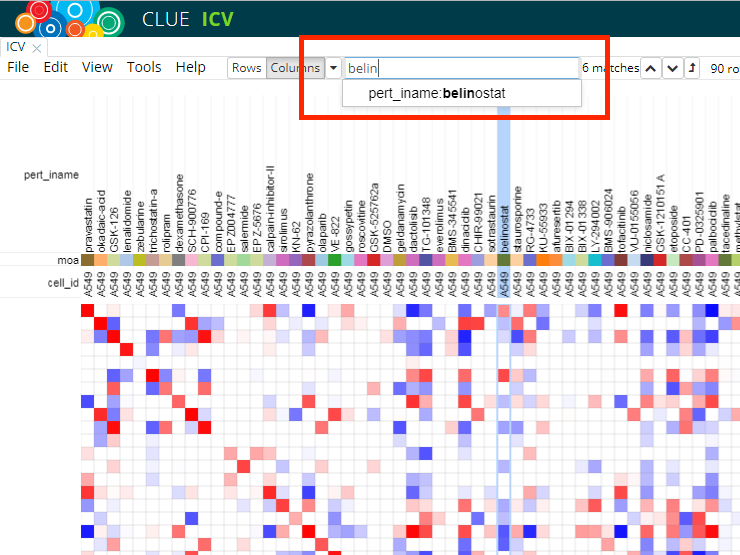 You can click and drag, use shift click, or use the search box to pick all the instances of belinostat. 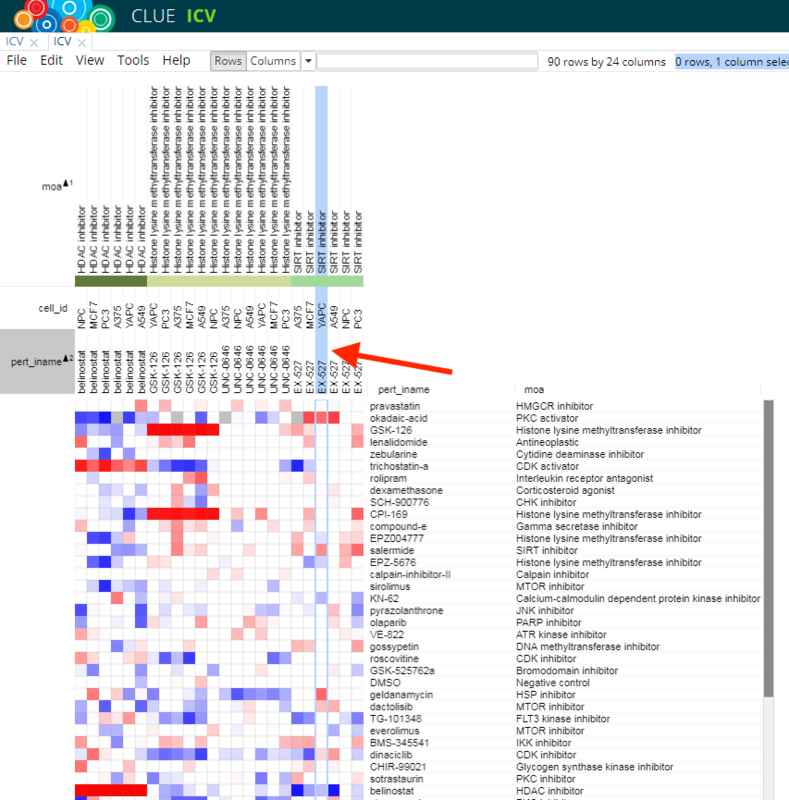 Now right-click in the column header area to reveal a menu. 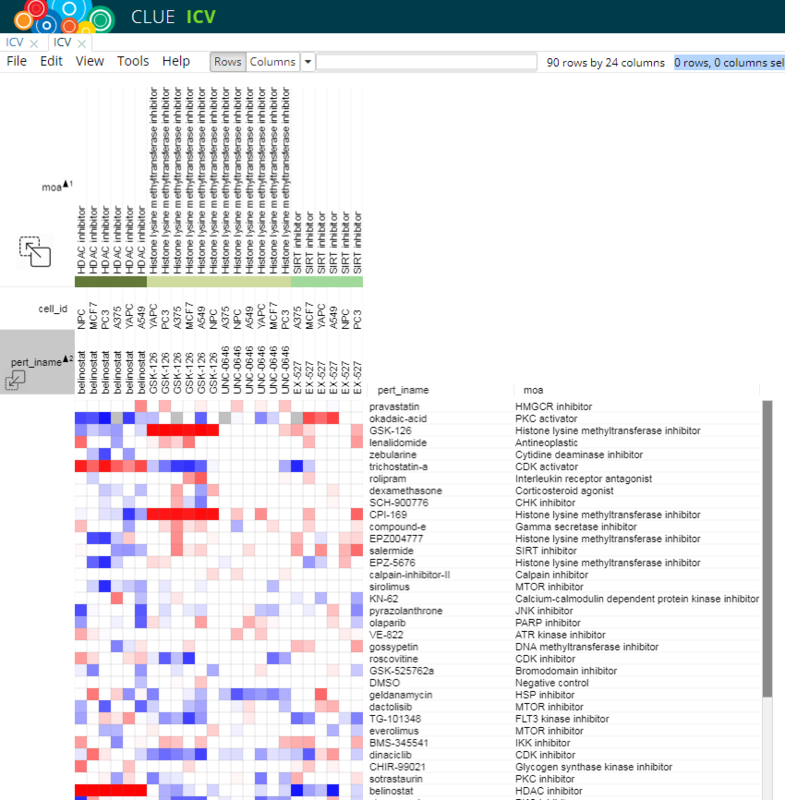 Pick “Sort Heat Map Descending”. 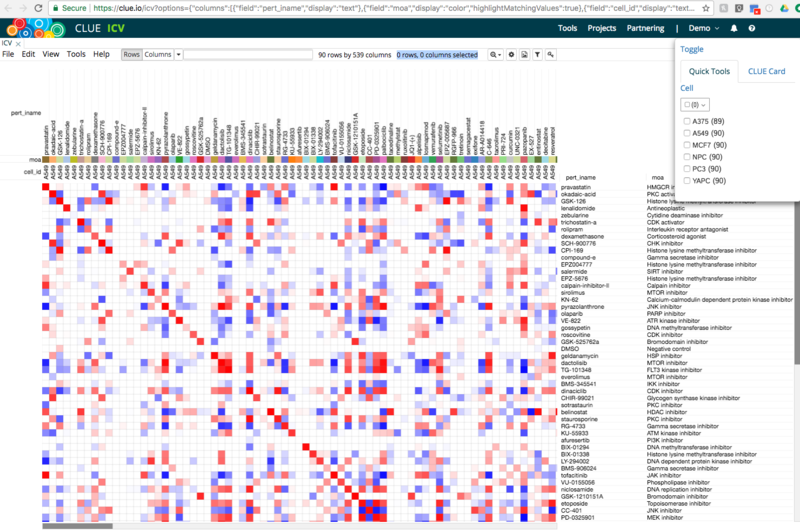 You have sorted by the median aggregate connectivities of belinostat in all of the different cell lines. 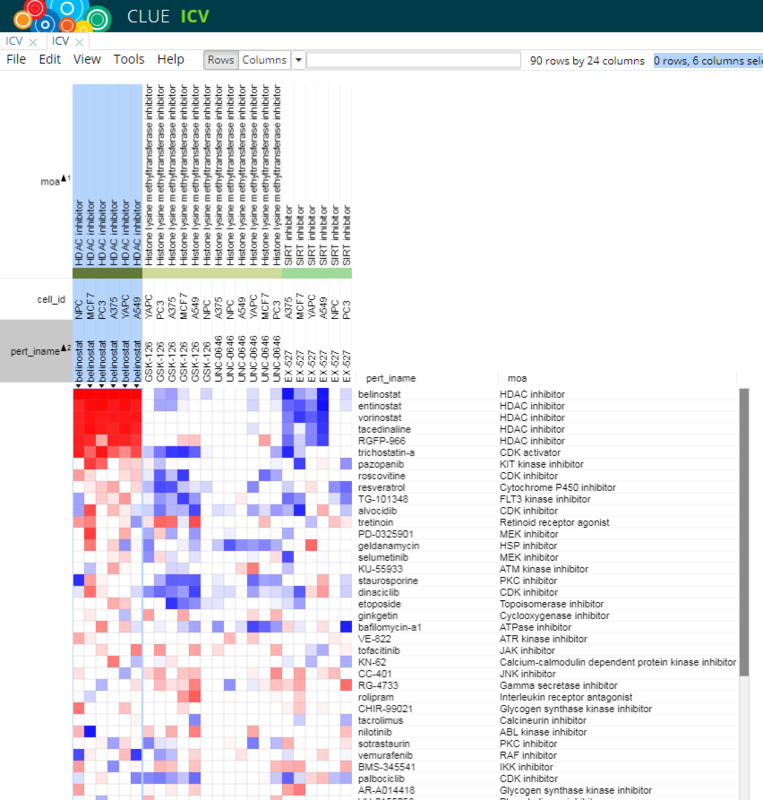 All of the top connections are other HDAC inhibitors (yay!). It makes sense that belinostat, an HDAC inhibitor, induced effects similar to other HDAC inhibitors. 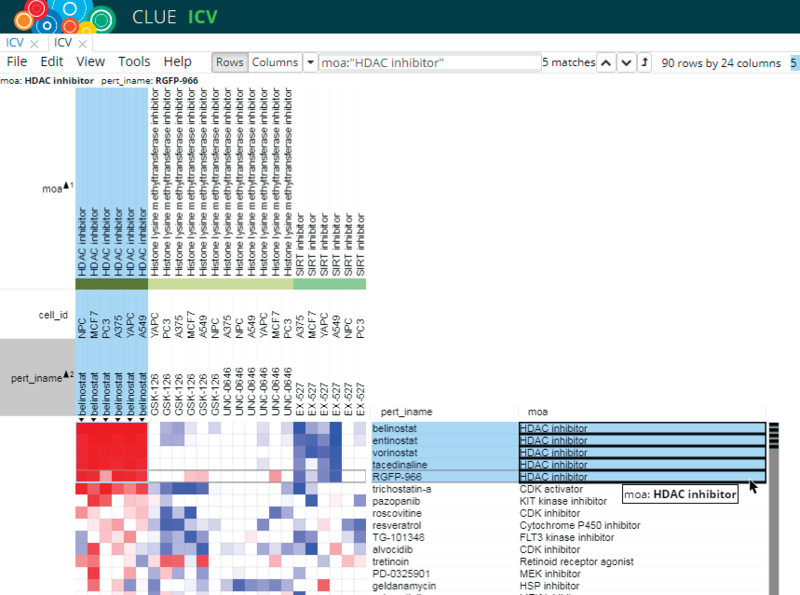 To further illustrate ranked enrichment of a mechanism of action (MoA), you can mouse over any of the “HDAC inhibitor” entries in the “moa” column of the row metadata. All other matching entries will be automatically outlined with black boxes, and tick marks will appear to the right in the scroll bar, indicating the positions of matching entries in the entire list. You can also type in any MoA into the search box at the top. Make sure the “Rows” button is selected. All matching entries will be highlighted in blue and automatically selected. You can use CLUE Cards to learn detailed information about the connected perturbation. 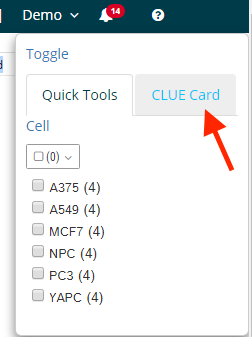 Click the “CLUE Card” tab in the floating box at the right. 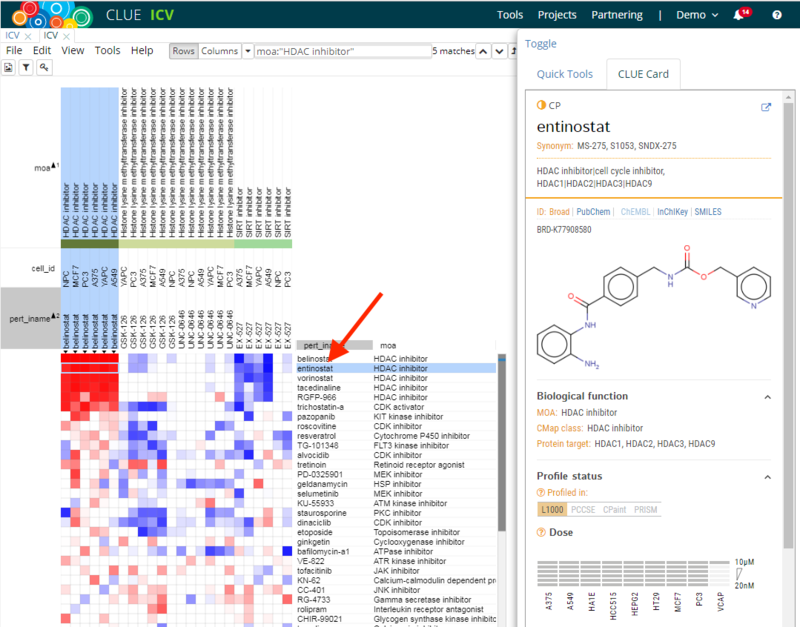 Select the entinostat row by clicking on the word “entinostat” in the row labels to the right. The CLUE Card will display lots of useful information about the connected perturbation. 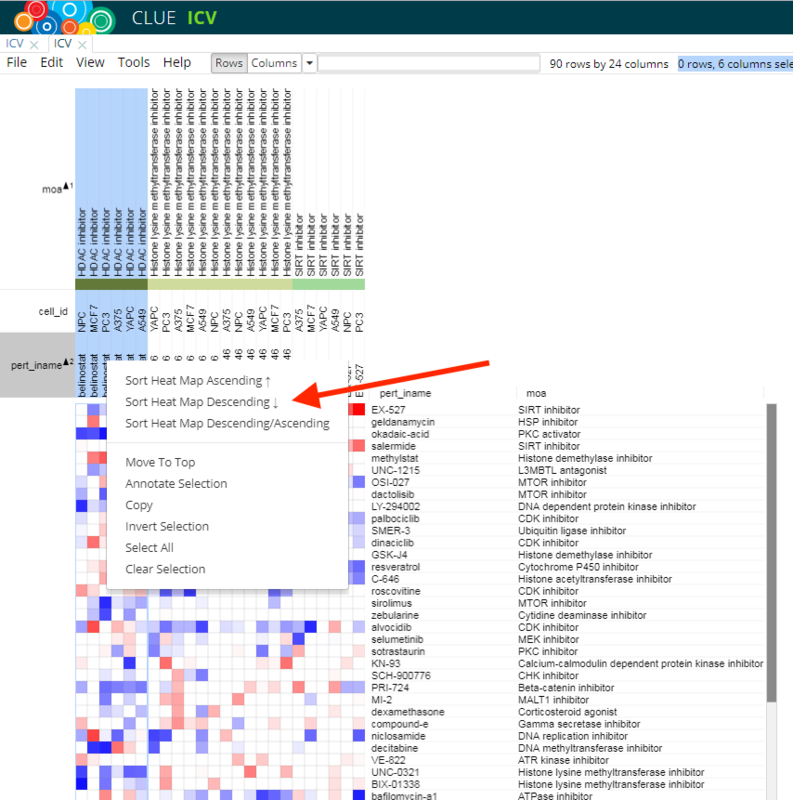 Tip: the CLUE card displays information about the row perturbation only, not the column. 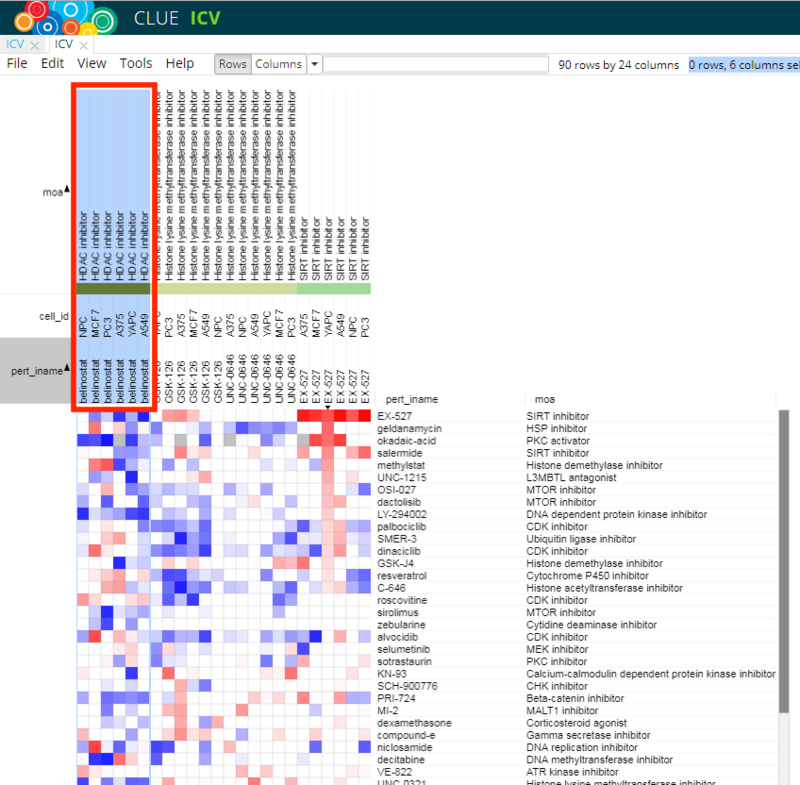 In the near future, you will be able to use the CLUE Cards to navigate among different data types in which the same perturbations have been profiled (i.e., L1000 and P100).